The art of Goran Trbuljak, which developed in the area of Yugoslavia concurrently with similar practices on the international scene, represented a radical shift in the understanding of art. The artists of the so-called New Art Practice were introducing changes in this field, applying different methods of action, particularly vis-à-vis modernist tradition in art. Consequently, in the spirit of social and political changes that took place in 1968, artists started using art media that were considered nonstandard at the time, and their space of action extended beyond the comfort zone of institutions. Trbuljak’s work should therefore be observed in the context of conceptual practices that direct the attention towards the idea of a work of art, examining the materiality of an object as the bearer of sense. It should certainly be noted that this is not about a complete dematerialization of an object, but about the primacy of an idea which an artist deliberately anchors, over and over again, in a carefully selected medium of expression, from an exhibition, street action, object, picture, book, photograph, text or experimental film to something that exists on the edge of tangibility. Instead of presenting a chronology of Trbuljak’s oeuvre from the late 1960s onwards, exhibition called a never before seen work by an unseen artist tries to determine the main forms and contents of Trbuljak’s sentences typed on an A4 paper with a typewriter. These are his works from Thisism series, created over the period from 1971 to 1981, which are now exhibited as an independent piece of art for the first time. 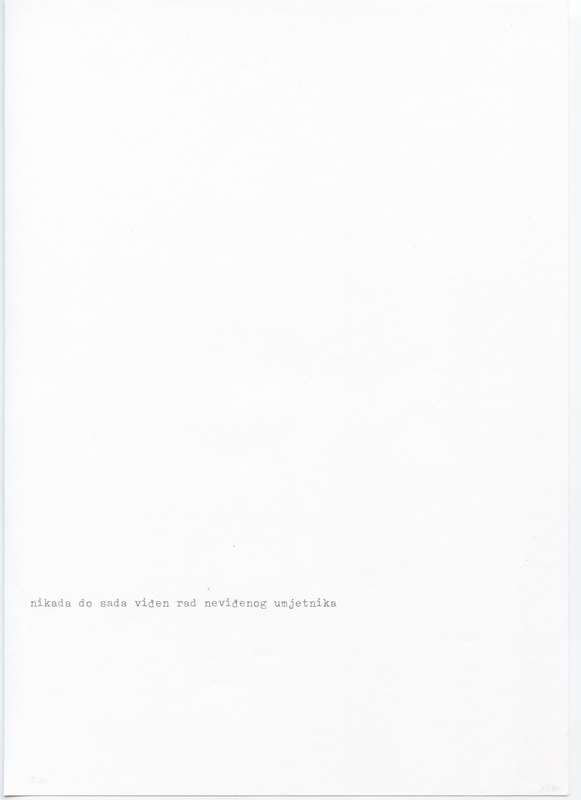 This series contains everything that is characteristic for the majority of Trbuljak’s works, from his employment of alternative ways of production and presentation of his work, to his specific strategy of defining the status of an artwork in relation to institutional, gallery and market system. It is worth mentioning that Trbuljak was the first artist who, in the context of New Art Practice, directly questioned the notion of authority and the system of contemporary art. The artist’s minimal and often ironic gestures debunk the myth of the Artist and his historical role; yet, these typewritten entries keep examining the relationships of power in the field of art. And precisely this principle of action becomes the key to understanding the exhibition that entwines two guidelines on the level of content. The horizontal reading gives an overview of the artist’s ponderings on art, society and everydayness. The typewritten lines mostly refer to the ways of observation or perception of art, but at the same time they reveal an engagement by which the artist sums up his immediate experience, including both his inner conflicts and the conflicts with the system in which he works. We can read the entries not just as a reflection or a critique, but also as a high form of self-reflection and self-critique that intertwines with global questions about art and society. Of course, vertical reading indicates that these entries are not just witty and fragmented language formulations invented in a neverending analysis of the society and the world of art, but they also function as a whole; they function as an expression and a medium, revealing the relationship between the system of art and a work of art. By interweaving these two levels the author examines the position of artworks in art institutions such as museums, galleries and art collections, but also the positions of artworks outside this scope, which in light of Trbuljak’s practice question the place of known and unknown artist within the system of art, touching also upon artists’ relationship to the public and the conditions in which the audience meets with works of art. The entire oeuvre of Goran Trbuljak can be understood as a refined “resistance” against the modernist sensibility, which should be viewed in a specific context with which a work of art communicates. The same goes for conceptual and formal gestures. Even though the exhibition is elementary in a formal sense, it is impossible to miss the fact da these sheets of paper take over the positions of all the media in which Trbuljak has ever worked. Lines such as feel the sculptural beauty of this text by moving around it slowly or this text is my painting indicate that Trbuljak consistently investigates his medium of expression, where the texts occupy the form of sculpture, i.e., painting. Trbuljak started working on the series Thisism in the early 1970s. It was a continuation of his anonymous street actions and he coined the sentences as descriptions of photographs that were taken in the actions. 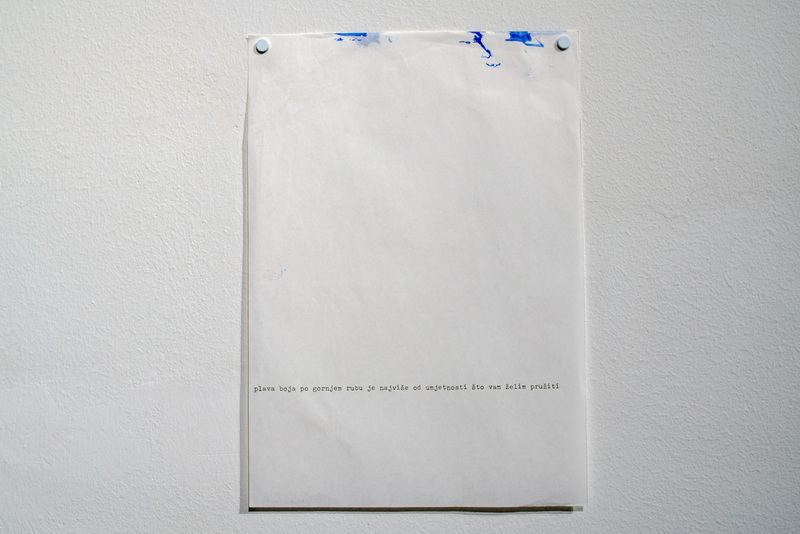 While this “continuation” was conceptual and formally direct, the author’s interest in other media reveals something subtler – not in the immediate physical transition onto another form that he usually works with, but as a possibility of transition among multiple forms in the process of observing the typewritten entries on an A4 sheet of paper. This Trbuljak’s tendency is the least visible but at the same time most obvious in his act of juxtaposing Thisisism to Thisisn’tism series, where he eliminates the textual meaning and transforms it into a white monochromatic surface. The connection between the two series perhaps most accurately represents Trbuljak’s life dialectics, which is constantly stretched between two opposing elements. At first glance, this exhibition is formally simple and temporally limited. However, a closer look clearly reveals the artists endeavors that build conceptual foundations for his later work. Bearing in mind that Goran Trbuljak marked his oeuvre with a retrospective back in 1981, it is important to note in the context of this exhibition that this is not another retrospective, but an overview of the artist’s examination of the ways we observe and experience art. Finally, it seems that the entire exhibition, consisting of a complex meshwork of Trbuljak’s entries, may be understood as a paraphrase of one of the lines: this work anticipates all later works.